The effect of tossing a card into the air and having it return to the pack is one of the most wonderful effects that can be performed with cards. It is, to be sure, a feat of juggling, but when the card is caught in the dcck at any number down named by the spectator, it is something that is long remembered. I had the pleasure of witnessing this effect performed by Cy Endfield at a convention in New York in 1962. Needless to say, it was one of the most memorable moments of the convention for me. 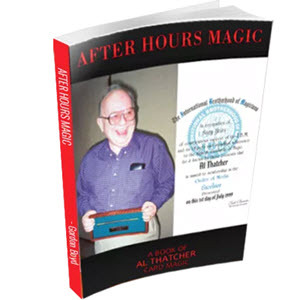 Cv's method is clearly explained in "Card Spinning" in Part III of his fine book "Entertaining Card Magic," pages 13, 14 and 15. My method differs from Cv's, both in the actual toss of the card and in forming the break in the pack at the selected number. Have a pack of 52 cards in your hands. Ask the spectator if he has ever been to Australia. Then ask him to name some things that Australia is famous for. Finally, ask the spectator to name a number from 1 to 52. As soon as you have his number, remember it and perform Ed Mario's "26th Card Faro Check." See Ed Mario's book "The Faro Shuffle," pages 11 and 12. For those who do not have access to the book, the method is briefly explained as follows: Cut the pack at 26 and start a Faro Shuffle as in Photo 1. Now if the cut and weave have been perfect, every card will be weaved with no cards left over, thus you will be sure that the cards have been cut at 26. If not pull the packets apart, square up the deck, and cut again, performing another Faro Check. When you know that you have cut to 26, pull the packets apart, unweaving the shuffle, slap the right hand packet at a downward angle onto the center of the left hand packet, and let the upper packet slide forward until it butts against the left first and second fingers. This will cause the bottom card of the upper packet to become injogged. This is the 26th card. Stock.' Suppose the spectator names number nineteen. Hold the pack for an overhand shuffle. Form a break at the jogged 26th card with your right thumb. Shuffle off to the break and now run single cards, counting as you do so. Form a break with your right thumb under the jogged card and shuffle off to the break. In jog the next card and shuffle off. You now have your nineteen-card stock under the jogged card near the bottom of the deck. Form a break with your right thumb under the jogged card again. Shuffle off the large portion of the deck to the break, injog the next card and shuffle of again. You now have your nineteen-card stock at the top, marked off with a jogged card. So, you see, you can float the stock up and down in the deck by using this system of counts, throws and jogs. If the spectator names a number close to 26, you wotdd form a break at 26 and either pick up or drop one or two cards to reach the correct number, forming a new break. Now if the spectator names a number higher than 26, you would perform the following actions: Form a break with your right thumb at 2 6 and shuffle off to the break. Suppose the number named is 3 1. Start running single cards, starting your count on 27 and count up to 31. Injog the next card and shuffle off. Now your 31-card stock is belowr the jogged card. Form a break at the jogged card and shuffle off to the break. Injog the next card and shuffle off. You now have your 31-card stock at the top, marked off with a jogged card. If the spectator names a number less than 10 or higher than 45, I ask him to give me another number to apparently make it more difficult. All of your operations from the 26 card Faro Check to and including the stock at the top of the pack, marked off with a jogged card, should be done while the spectator is naming a few things that Australia is famous for. Usually he will name the Outback, beer, beautiful women, etc. He will seldom name the boomerang. If he doesn't, then you say, "What about the boomerang?" Hold the pack in your left hand in dealer's grip, forming a left little finger break at the selected number. Take off the top card of the pack face up in your right hand. (See Photo 2) Notice that the right forefinger is curled around the index corner of the card. The thumb is on the face, and the second finger is curled on the back, to hold the card. Cy Endfield mentions that he throws the card up at a thirty to forty-five degree angle. This is fine, after quite a bit of practice. In the beginning I recommend a toss of eighty or even ninety degrees. When you toss the card straight up, it will return straight down and not waver off to the side as sometimes happens with a flatter toss. 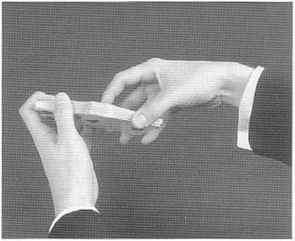 Toss the card up with Lhe right hand and at the same time apply backspin with the right forefinger. But just before the toss, stop, look at the spectator, and ask, "What do you call a boomerang that won't come back?" Smile and say, "A stick!" Now make your toss. While the card is in the air, quickly reach down with your right hand and lift off all the cards above the break. 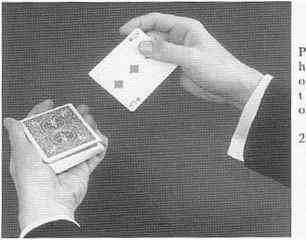 Reach forward and catch or trap the spinning card between the halves, slapping the right half onto the left. Pause, smile, and say: "Evidence of a misspent youth!" Hand the pack to the spectator and have him count down to the face-up card. The tossed card will be at the number named. Cy describes a fancy one-hand catch of the tossed card into the pack. This takes considerable practice. From my experience 1 have found that the two-hand catch, as described here, is all you need to create a wonderful effect.